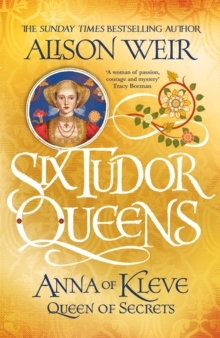 'Alison Weir transforms Henry VIII's much-maligned fourth wife into a woman of passion, courage and mystery' Tracy Borman Alison Weir, historian and author of the Sunday Times bestsellers Katherine of Aragon: The True Queen, Anne Boleyn: A King's Obsession and Jane Seymour: The Haunted Queen, paints a spellbinding portrait of Anna of Kleve, Henry VIII's fourth queen. 'This six-book series looks likely to become a landmark in historical fiction' The TimesA GERMAN PRINCESS WITH A GUILTY SECRET. The King is in love with Anna's portrait, but she has none of the accomplishments he seeks in a new bride. She prays she will please Henry, for the balance of power in Europe rests on this marriage alliance. But Anna's past is never far from her thoughts, and the rumours rife at court could be her downfall. Everyone knows the King won't stand for a problem queen. ANNA OF KLEVETHE FOURTH OF HENRY'S QUEENSHER STORYAcclaimed, bestselling historian Alison Weir draws on new evidence to conjure a startling image of Anna as you've never seen her before.